It's time for the Papertrey Design Team November 1st Challenge! When Nichole suggested that we reflect upon all the blessings we have in our lives during this Thanksgiving month, I began to think about all the things I have to be thankful for. 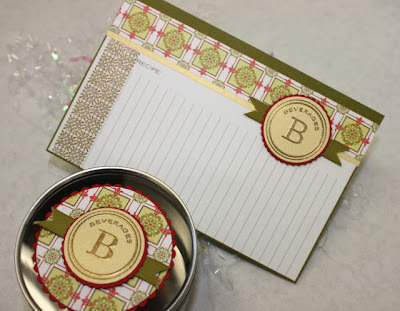 Her challenge to the Design Team was to use stamping to help bring blessings into other's lives also. What a perfect time to make a special effort to put a smile on some one's face by sending them a card or making someone a homemade gift. This holiday season, my girls and I are going to be making cards to send to children with life threatening illnesses who need a pick me up. The Make A Child Smile Organization is a wonderful website that features such children. You can learn about the children, their illnesses and find a few kids featured each month. Or you can print off the entire list of kids and make it a goal to send a card to each child this holiday season. You can see a list of all the current kids HERE, where you'll find their name, age, state, type of illness and a photo. Please take a moment to visit this wonderful website and to learn more about these courageous kids. Here's my first cards that I'll be sending out some kids from the MACS list. I used Papertrey's Pond Life set to create a fun and bright caterpillar pocket card. The fun polka dot background paper is PTI's Polka Dot Parade, as are all the colorful ribbons. I thought that some pocket cards would be a great way to add in some additional messages from the girls and perhaps some stickers. Candy and/or gifts are discouraged...a card is all that is suggested and needed to brighten a child's day. My finished card measures 4.25" x 5.5" and is just held together with two brads. I added some *messy stitches* to the pocket card insert. I used the Spellbinder's Long Rectangle Dies to cut and emboss my caterpillar image. For the sentiments, the MACS organization says it's best to stay generic and to not use *get well soon* type sentiments. Many of these children will unfortunately not recover from their illnesses so a simple *hello* or *thinking of you* type sentiment is more suitable. I know the girls will jump right in to help out making cards, so I started them off with a little card kit. I stamped some cute owl images and sentiments from the Wise Owl stamp set. 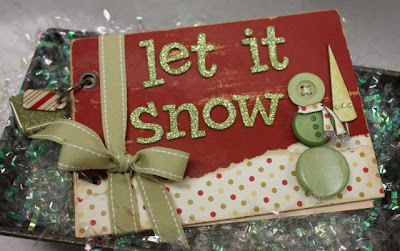 I added some precast cardstock, ribbon, patterned paper, brads and envies. Then I packed the card kit items into a large Papertrey glassine sack and added a printed label to the front plus some white polka dots from the Polka Dot Basics stamp set. I will keep refilling the card kit sack as needed and will keep it hanging in my stamp room. I told the girls where the card kit sack is and that they can use whatever supplies they want to complete the cards. I'm also going to hang up the address list and some stamps. I'm encouraging my girls to send cards to these kids in hopes that they will know just how lucky they are to be healthy kids and to really appreciate the things in life they have. I would like to extend a challenge to you also, my fellow bloggers. I would love to get 40 of my wonderful blogging friends to pledge to making cards this holiday season for some sick kids who would love to receive a card of cheer. You can use cards that are in your stash, you can make new cards, get together with your church members to make cards, have your kids help, send a card a week.......whatever you want. Imagine how you feel when you receive a birthday card in the mail. Now imagine how a child who is terribly sick and possibly hospitalized will feel when they receive dozens of cards just for them. It makes my heart swell just thinking about it!! I hope you will join me this holiday season in spreading a little cheer. If you would like to make this pledge of your time, a few supplies and some postage stamps, please leave a comment to this post. I will be updating this post with all pledge names. I thank you in advance if you choose to join me. It will mean so much to me and all these wonderful kids. 15. Kelli, Faith,Daniel, and Jolie from Lynn Haven, Florida....awesome guys!!!!!!!! 20. deedee......I knew I could count on you! 25. Kim, Molly,and Amanda from Michigan....you go girls!!!!!! 30. Melanie from Australia is going to pick a similar organization near her, woohoo! 31. Jennifer, Andy and Jacob....you guys rock!!!!!!! 33. Robin Owens and family.....bless you guys!! 51 Heather McNally.......HI Baby Cakes!! There were a lot of other comments on this post but I wasn't sure if you signed up or just wanted to give a shout out. So if you took the pledge, thank you!!! How about a Christmas card on this spooktacular Halloween day? LOL! Happy Halloween everyone!! My girls are excited to trick or treat tonight. I love the excitement that comes about when the girls are scurrying to put their costumes together....then we make them put on tennis shoes pants under their costumes and a coat over their costumes! All is good though. Today I have short post because it's out the door for me to sub. I made this Christmas card that has the sentiment front and center as a focal point. I used the JustRite set called Christmas Stamp Ensemble. The sentiment borders and centers fit onto a big circle wooden stamper and are all ready to be stamped. I used the new gold metallic ink from Papertrey and it worked wonders, dries fast too. My background paper is some older patterned paper from my stash. Gold metallic ribbon from Papertrey Ink. I used Spellbinder's circle and scallop dies to cut out my sentiment. Again, the JustRite stamps were designed to coordinate perfectly with the Spellbinder's Nestabilities. A few sequins an a felt snowflake finish up my card. Here's a closeup view of the sentiment stamped in the gold ink. Very shimmery. Be sure to check out Splitcoast Stampers for information about JustRite stamps. Here's good product information HERE. 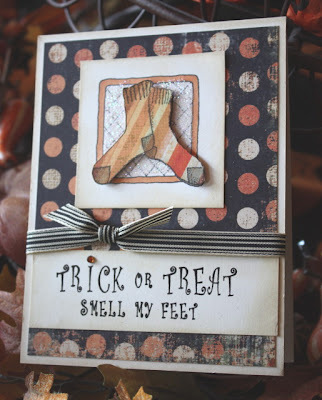 And HERE is a great tutorial by Sharon Johnson for conditioning your JustRite stamps. Have a frightfully ghoulish day everyone!! Guess what? The new Spellbinder's Nestabilities are being shipped!! Grab 'em while you can! The card I made for today showcases the Label 1 die on the red layer. I love the shape and I know you all have been waiting for it! You can check out Ellen's blog HERE to find out what she has in her store. 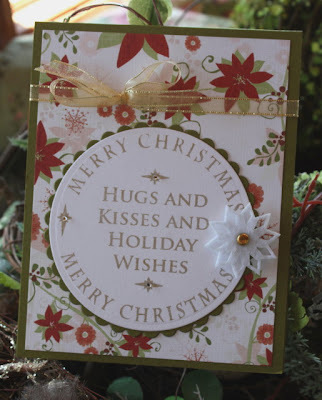 Some other new stamping supplies I've been using are Karen Lockhart's new Christmas images. 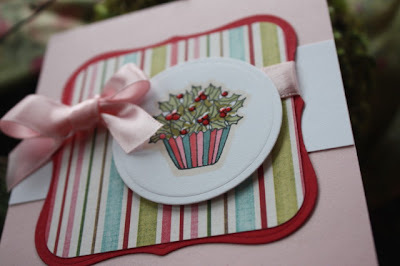 Today I used the darling Holly Cupcake image that I've colored with my Copic markers to match my patterned paper. I cut out the image and embossed it with a Spellbinder's Circle Nestabilities die template. I just love the bright, cheery colors on this card. I think it will be perfect for a December birthday. And if you check out this view below you can see that I added some of my favorite Ranger Glossy Accents to the berries to make them shine. I love that look!! Background patterned paper is My Mind's Eye. Solid cardstock and ribbon from Papertrey Ink. Sentiment from Karen Lockhart. Have you started your holiday card stash yet? 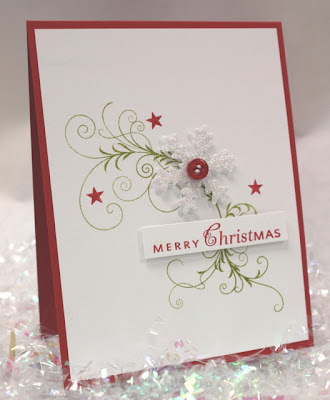 Have you been working on Christmas cards? It's almost November so it's a good time to get a head start. Have fun creating this holiday season. Hi everyone! I hope you all are better rested than I am. Dear Husband is in snoring mode for the winter which means I am in non sleeping mode. I....AM....GRUMPY! But I've got a cup of java right beside me and a hot shower waiting so maybe that will wake me up. Do you have a snoring husband????? Anyway, thank you for the responses to yesterday's post. I have decided to do a Daily December album like Ali's. I have my cover done and all of my supplies in a basket. I'll show you my progress soon! 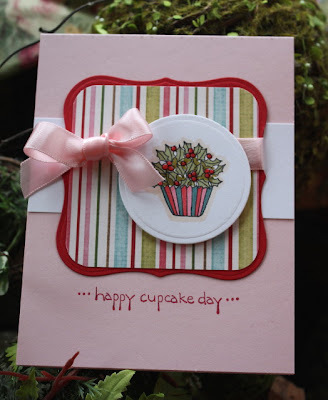 For today I have a cute little baby card that uses Just Rite stamps. I think these Mary Jane shoes are so adorable. They're from the set called Baby Stamp Ensemble. I chose to color the little shoes with Copic Sketch Markers and then cut them out. I added foam dimensionals to the back of the shoes and then adhered them to my oval image. I added two little shiny sequins to the sides of the shoes. I cut out the borders portion of my stamped image with a Spellbinder's Scallop Oval die, then embossed it also. Background paper is from Cosmo Cricket and ribbon is from Papertrey Ink. I hope you have a GREAT day! I'm finishing some stuff up for a great neighborhood Halloween scavenger hunt that my country neighbors are hosting. I'm helping with the planning this year, it's sure to be a ghoulish good time. 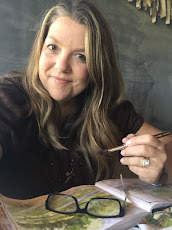 Check out Heidi Swapp's blog HERE. The first post is a fun one about her son's birthday. I was particularly intrigued by the handmade quilt Heidi's mother made for Heidi's son for his birthday. Totally made from repurposed t-shirts and jeans. So cool!! I have this on my list to do for the girls, saving their old tshirts and jeans. Scroll down to Heidi's second post and read the going green sign she made. It says *fix it up, wear it out, make do, do without* and she's even given a printable link. I love that saying and am trying to go a little more green around here......throwing out stuff I don't need, making do with what we have, cutting down on expensive gifts, recycling, giving to others. And check out Ali Edwards' blog HERE. Ali's always got something good up her sleeve. I love the idea of her December Daily album and would love to do one this year. Today she shows her album that is all ready to fill in with journaling and photos. Yesterday was her Day one post, talking about what album she chose and it shows last year's album too. I think you could set up an December Daily Inspiration Station and put this together pretty quickly. And how about using only supplies you already have in your stash? That would be an awesome challenge! Sooo, what have you done to *go green*.....to give to others.....to prepare for the holidays with your family? I'd love to hear your ideas. Last year I made advent tags with the girls and we had a great time. We'll see what I can accomplish this year. Edited for questions: Kerry asked: I have a quick question about embossing w/ your nesties. Do you do it at the same time that you cut or run it through a second time?Thanks! When using Spellbinder's Nestabilities, you do the cutting first with the thin, white spacer plate. Then to do the embossing, you place the cut paper with the die still in place back through the machine.......this time using the tan embossing mat on top....cutting side of the die facing up. Also, I've been asked how I keep a Nestabilities Die Template centered over an already stamped image while cutting. This can be tricky because the dies can shift a little. My little tip is to place a small piece of clear tape over the metal die and overlap it onto the paper which will become the scrap/negative cut paper. This keeps the die right where I want it while running it through the machine. Hope that helps! As I'm writing this post, I'm snuggled up in warm clothes and Eric has a nice fire roaring in the fireplace. The wind is blowing really hard and it's a bit nippy outside! My beautiful flowers that have lasted so long this year will most likely be wilted tomorrow. Eric made sure to unscrew the hoses from the house. He made a final swipe of the tallest grass around the house with the lawn mower. We put away the summer clothes and brought out the jackets and sweat suits. I've brought out my soup recipes. Eric brought the wood rack up to the back deck. What's all this mean? Winter is on it's way to Kansas! Tonight it's supposed to get down to below freezing...the weather man says 29 degrees. So as much as I don't like the cold, I do love that we get to experience all four seasons here in Kansas. So I might as well not complain, cuz winter is going to come whether I like it or not. Sooo, I thought I would get started on some wintry cards for the upcoming holiday season. I'll be showing you lots of cards that I'll be adding to my stash. I figure if I make a card a day I'll be all set by the time December rolls around. 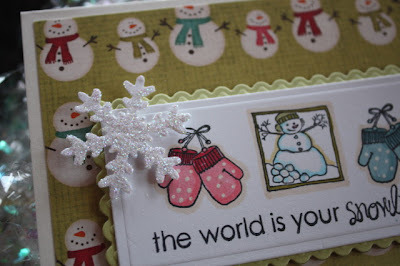 Today I'm using some new Karen Lockhart stamps called Itty Bitty Snow Buddy and Itty Bitty Mittens. I wanted my focal image to be bigger than the space that just one Itty Bitty stamp fills up so I decided to stamp a series of the images to make one big focal point. I tied all three images together by using a Papertrey sentiment. Then I cut out my image with Spellbinder's long rectangle dies and a long scallop rectangle die. I used the tan mat to emboss each layer which added a lot of texture and dimension to my card. My images were color with my trusty Copic Sketch markers and I used a white gel pen to create the polka dots on the mittens. The stamped images tie in nicely with the snowmen patterned paper by My Mind's Eye. I added a final embellishment of a glittered snowflake punch. Wanna learn how to color some awesome snowmen this winter? Check out Marianne's blog post HERE to learn more about coloring a snowman. She has some great tips that you will definitely want to check out. Okay, I'm off to snuggle up with a good magazine by the fire. Have a great week everyone! And hey, don't forget about Halloween! We can't forget about all the trick or treaters this week. My girls are getting excited. And me too, I can't wait to follow them around town while it's like 30 degrees!!!!!! Yeehaw! Edit #2: Dried beef is not beef jerky. It's very thinly sliced, salty beef that has maybe 10 slices to a package. The brand I use is called Carl Budding and comes in a plastic sealed bag. In the grocery store, you can find it by the bologna and packaged luncheon meats, usually hanging up. It's also the meat that is used a lot for Chipped Beef on Toast. Edit: I've added a label to attach to each recipe post I do. The link on the label *CK Becky Font* will take you to the free download of this font at Becky's blog. The links to the label *Recipe* will take you to all my posts that have recipes. I'll try to add this reminder to my recipe posts. Enjoy! How about another recipe? Every month at the high school where I sub, there is a birthday luncheon. The teachers take turns bringing in lunch goodies each month. I was lucky enough to sub on a day when Mr. Hatfield brought in his wife's yummy Pickle Dip. Mr. Hatfield is the girls' PE teacher and he is young and fun and cute and everyone loves him!! 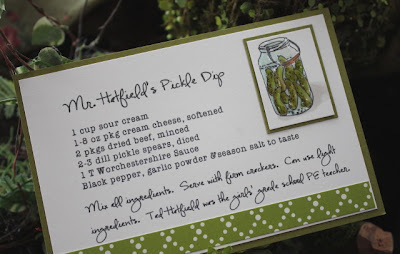 I requested the recipe and the girls said I HAVE to name it *Mr. Hatfield's Pickle Dip*. So there ya go. If you've ever had those pickle roll ups that have dill pickle slices wrapped in cream cheese and ham....well this is it in a much easier version. You chop everything up and make a dip out of it. That's MY kind of recipe, easy peasy!! I serve this with chips or crackers and it's always a hit at the parties. I thought you might enjoy the recipe because we all need a new recipe when the holidays roll around right? 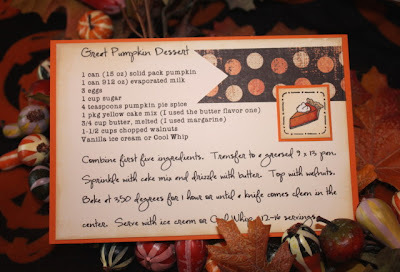 To make my recipe card, I printed the recipe off with my usual Creating Keepsakes Becky Higgins and AFL Non Metric fonts. 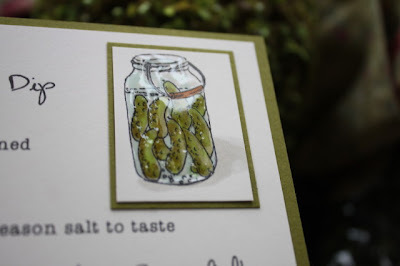 I chose Karen Lockhart's Pickle Jar image for my accent. Those pickles just crack me up!! I colored the pickles with various green shades of Copic Sketch markers and then added a BG color for the glass jar. I used Ranger Glossy Accents to cover the entire jar to give it a realistic effect. Finished recipe card measures 4" x 6". Mix all ingredients. Serve with firm crackers. Can use light ingredients. Note: I have SOOO much to share with you all....weekend trip photos from our little day vacay we took yesterday....my first quilt block........a new quilt store I found and NEW fabric (it's as addicting as collecting papers and ribbons!! ).......recipes........my holiday cards blitz...and more. Stay tuned, I have so much to share that I'll probably be posting every day that I can. Have a great finish to your weekend, peeps! If you like the handwritten looking script font I use for my recipe cards, here's the link to get the font for FREE. This link will take you to Becky Higgins' blog....then click on the *product* link at the top of her blog. The free download for the font will be right there. Have fun!!! Edit #2: Yes, you sprinkle on the cake mix dry. Then you pour over the melted butter. It all bakes up wonderfully...the bottom is like the texture of pumpkin pie and the top is kind of a crumbly crust. Just made it yesterday and we had a piece after the football game. Yummo!! Edit: For the solid pack pumpkin, it comes in a can and is just pumpkin without any seasoning. Just make sure you don't purchase pumpkin pie filling......you just need plain pumpkin. And I made a type.....it should read 1(12 oz) can evaporated milk. Enjoy! Mmmmm, this time of year brings around the pumpkin desserts and pies. This is a great recipe that I make every year. It's kind of a cross between pie and cake and it's heavenly, especially with Cool Whip or vanilla ice cream. And the butter flavor cake mix makes it melt in your mouth. Hmmm, maybe I'll make this for my dad's upcoming birthday....surely he'd invite us to stay for a little morslet don't ya think? You know I love to add to my handmade recipe collection and this one will be used over and over again. 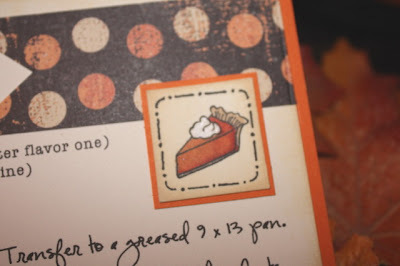 I used Karen Lockhart's cute little Itty Bitty Piece of Pie stamp. I stamped the image on vanilla cardstock and colored it in with Copic markers. I also used the little Lockhart outline stamp too, perfect for all those Inchie projects. To make the dollop of Cool Whip stand out, I colored it in with a white gel pen. It really pops on that vanilla cardstock. 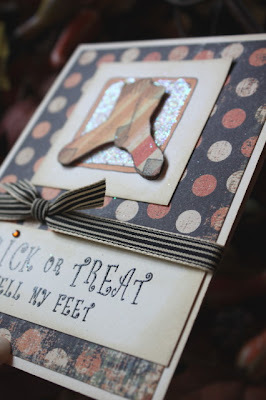 The patterned paper is from My Mind's Eye, the colors instantly make you think *pumpkin*. For all my recipe cards, the script font is Creating Keepsakes Becky Higgins and the typeset font is called AFL Non Metric. Finished card size is 4" x 6". Here's a close up of the pumpkin pie accent. Combine first five ingredients. Transfer to a greased 9 x 13 pan. Sprinkle with cake mix and drizzle with butter. Top with walnuts. Bake at 350 degrees for 1 hour or until a knife comes clean in the center. Serve with ice cream or Cool Whip. 12-16 servings. While looking through my stash of stamps, I thought it would be fun to dress one of Karen Lockhart's shoes up for Halloween. Well, as you can see below, my thought process got a little out of control to say the least! I had first thought about making a shoe look like a witch's shoe but then I saw the Pasta and Meatballs stamp. Anyone would immediately see blood and goo and eyeballs right? Okay, maybe not!! My mind definitely thinks out of the box sometimes. Then I thought about a sentiment. 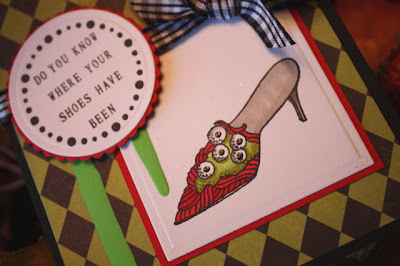 What could you pair with shoes that have eyeballs? JustRite Stampers to the rescue again! Did you ever watch that scary movie where the babysitter keeps getting phone calls asking, *Do you know where the children are? * That movie really creeped me out when I was young!! That's what made me think of my sentiment. I was able to spell out the words with the JustRite Small Alphabet Stamp Set and a circles border stamp, using the smallest round wood block stamper. I cut the circle out with a Spellbinder's circle template. Again, the JustRite stamps were designed to fit perfectly with Spellbinder's Nestabilities dies. I mounted the circle onto another scallop cut die from Spellbinder's. For the shoe image, I used Copic Sketch markers and then added some shine to the eyeballs using a black glossy gel pen. I cut the image layers with rectangle Nestabilities from Spellbinders. My final finishing touches were some green and black harlequin patterned paper, black and white gingham ribbon and some bright green craft paint seeping down the card. Hmmmm, now who do I know that would appreciate this somewhat twisted card??? By the way, Marianne from Copic has some great posts on her blog about airbrushing. Check out her great tips HERE. My realtor friends wanted some card refills so I was happy to oblige. I'm glad to hear that their business is doing well enough to have the need for *congratulations on your new home* cards. I was absolutely thrilled when Nicholed designed the Papertrey stamp set called Boards and Beams. 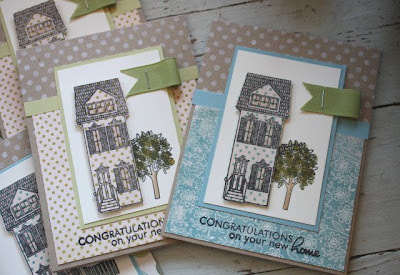 The details on the houses are fabulous and the sentiments are perfect too. 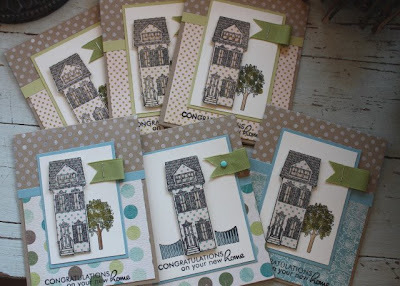 I needed to do a little mass production so there wasn't time to color all of the stamped houses individually. So instead I decided to do some paper piecing. I simply stamped the house image onto polka dot patterned paper by My Mind's Eye with Palette Black Noir ink. The design of the polka dot patterned paper was simple enough that it did not take away from the architectural details on the house. I cut out the houses with a sharp pair of fine tip scissors. I did use some Copic markers on the roof and window shutters to add a little bit of detailing. 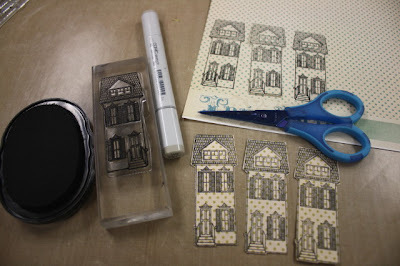 Next I popped the houses up on pop dots and adhered them to a few rectangle layers of cardstock. By stamping the tree image directly onto the cardstock and then placing the house in front, I created some perception of depth in my focal images. I adhered some Spring Moss Grosgrain ribbon to the focal pieces by cutting notches in ribbon then stapling directly to the cardstock. 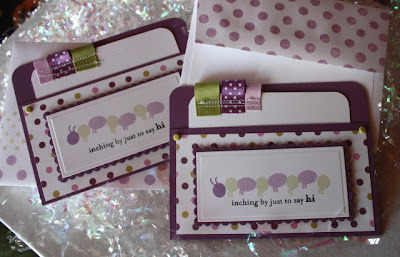 I used PTI Kraft cardstock for my card base and PTI Polka Dot Basics in white ink for the background. I was able to create a nice little stack of cards pretty quickly. By keeping the design the same, I saved time because I could easily get my production line going. Same size pieces, same length of ribbons, same size of patterned papers, same size cardstock mats, etc. So whatever kinds of cards you're making, remember to do some mass production sometimes. You'll be glad you took a little extra time to make a few more cards for your stash. 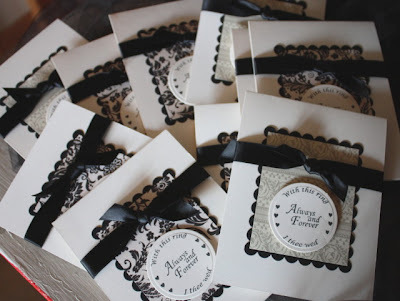 Last week I was given quick notice that a friend needed 15 bridal shower invitations, pronto! To speed up the process, I typed up the invitation wording, printed it off onto cardstock and layered it into the inside of the invites. This helped my hostess friend because she didn't have to hand write anything for the invites. Next, I reached for my handy dandy JustRite Stampers stamps. I chose to use the Weddings Borders and Centers set, choosing to cut off the flowery portion of the center stamps. (Note: be sure to click on the photo again...the images shown at the first link are not the correct images, but when you zoom in you'll get the correct view of all the wedding images). To use the Borders and Centers stamps, I choose the wooden Harmony I Classic Circle Stamper to hold the rubber images. I was able to stamp my outside card sentiments in no time. I simply went to work mass production style and stamped off 15 sentiments onto scrap vanilla cardstock. I then reached for my Spellbinder's Nestabilities Circle Dies to cut out the circles. I added the embossing also to make the invitations have a little more formal detail. I then cut some patterned paper and adhered the layers to black scallop cut rectangles from Spellbinder's Nestabilities. I adhered these layers to my vanilla cardstock, added the round embellishements with pop dots and added some black satin ribbon for a finishing touch. The great thing about the JustRite stamps is that they coordinate in size with the Spellbinder's Nestabilities dies. You're always able to find just the right size circle or other shape, because the stamps were designed to coordinate with the die shapes. I was so glad I was able to help a friend in need and just in the nick of time too. Back to Halloween today. Last year I got this cute little ghosty girl image from Whipper Snapper, designed by my friend Anna Wight. The ghost image has THE cutest little face and darling bow. The name of the stamp is called Sheila Ghost and is available HERE at Whipper Snapper. I didn't have time last year to create with this stamp, so it was a must for this Halloween season. I knew exactly how I wanted to color Sheila. 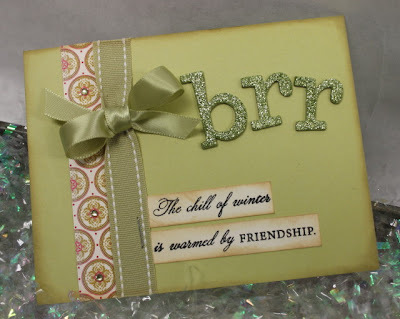 I stamped Sheila onto Papertrey's Kraft cardstock with black ink and then reached for my white pigment ink pad. I used inexpensive eye makeup sponges to apply white ink to the ghost image. It was very easy to blend and the white ink shows up very nicely on the Kraft cardstock. I then cut out the image with a rectangle Spellbinder's die and ink the edges of my rectangle while the metal die was still in place. I colored Sheila's bow a burnt orange color and added some glitter. I also used some pinkish colored chalk to color her cheeks. Isn't she just adorable? The background papers are from Making Memories and My Mind's Eye, my two favorite collections this Halloween. For the sentiment on my cards, I used the Small Alphabet from JustRite Stampers to spell out *hey ghoulfriend*. Ha Ha! I used a polka dot border stamp and small wood stamper from JustRite to frame my sentiment. I then added some dressed buttons and black and white gingham ribbon and my cards were complete. Here's a closeup of cute little Sheila Ghost, all dressed up in her finest sheet and sparkly bow. Now that I've made all these Halloween cards, I better get them mailed out to some spooktacular friends and family!! Have a great day everyone!! Happy Saturday everyone! I hope your weekend is off to a great start! I slept in til 8am and was awakened to the smell of wonderful coffee! Later on when the dew dries off, we're heading out to the timber to cut a load of firewood. The girls are excited for the first fire in the fireplace. It's not cold enough yet but we're stocking up on firewood. 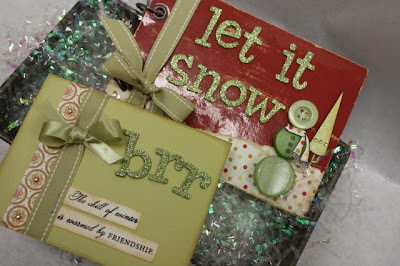 To get into the season a little, I thought I would share a little photo album I made using Papertrey's Made of Snow stamp set, designed by Nichole. In true Papertrey style, this set helps you to build the perfect snowman. All of the pieces and parts of the snowman are separate stamps, from the body parts, to the the scarves, all the way down the the tiniest details of the face and buttons. Be sure to click on the link to the stamp set so you can see all the pieces and parts. I have a drawer full of little albums so I thought I would start with this fun barn red album (source unknown). I used some of the Polka Dot Parade paper along the bottom edge. I tore the paper and distressed the edges with Ranger Distress Ink. 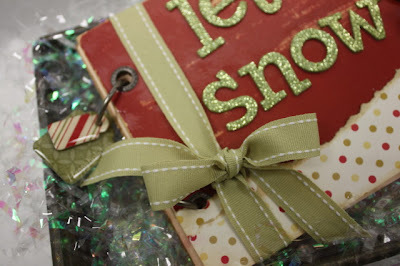 I used green, glittery chipboard letters for the *let it snow* album title and some Spring Moss Saddle Stitched ribbon to tie up the album. Same supplies were used for the matching card. Here's a single shot of the album by itself. Here's the fun detail of the snowman. 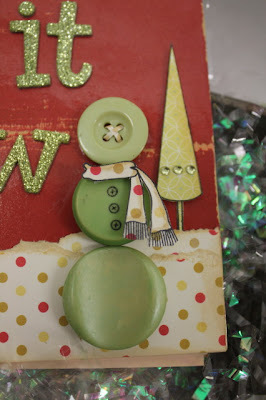 I used buttons from my Foofala collection in three different sizes to build my snowman. I stitched the top button for the head, added button stamps from Made of Snow for the middle body portion and a bigger button for the bottom body portion of the snowman. I paper pieced a scarf from Made of Snow and attached it with cut up pieces of foam dimensionals. I also paper pieced a tree from the Made of Snow stamp set and added three green sequin stickers. Here's a close up shot of the ribbon detail. I also added a few Making Memory epoxy stickers to the ring binding. Here's a close up shot of the super fast card I made using leftover letters. It would be the perfect addition to my little album for a fun gift. Maybe I'll fill the album with sledding photos that we take of the girls every year. Who knows, but it's a fun way to start the holiday season. Have a great weekend everyone!! What's the weather like in your neck of the woods?? Whooooooo knew October would fly by so fast! Halloween will be here before you know it. Do you have some spooktacular treats planned for teachers, friends and family? Today, I have some fun treat bags to show you that you can whip up in no time. Gather up your supplies and let's get started! Today, I have a helper...my good friend Carmen came over to play in my stamping room. She is kind enough to let me use her as a hand model. Her hands are much prettier than mine anyway! I knew that I wanted to use the PTI's Wise Owl stamp set for a Halloween project. While gathering up supplies, I found that a patterned paper from the First Fruits collection was a perfect selection! The layered design pattern reminds me of feathers on the owl's belly. And the colors were perfect for Halloween too. Whoooo's that looking at us? Before we get to the eyes, let's stamp on the owl's belly. I used belly that resembled the feather pattern in the First Fruits patterned paper. This belly image is from the Wise Owl Bellies stamp set, an additional set that coordinates with Wise Owl. Perfect combination. Stamp on the owl's beaks too. Now for the eyes. Stamp some big, googly eyes onto PTI's Stamper's Select White Cardstock. I punched them out with two sizes of circle punches. Next, cut squares of Kraft cardstock and adhere the patterned paper. Finished size is 3.25" square. Adhere the owls and a the sentiment rectangle. Bake up your favorite treats. I made Nestle Toll House Chocolate Chip Cookies, using the recipe straight off the package. I usually add about 1/4 cup more flour so they puff up a bit more. Bake them in a big cookie pan and cut into bars. No time for individual cookies, the big square bars will do! I added Halloween colored M & M's to the top of the batter before baking. Don't mix them in because you won't see them all. Sprinkle them on top so they stay bright and colorful. Slip the fresh baked but cooled cookies into a Large Glassine Bag. I LOVE these bags, they come in so handy! Fold over the top, punch a hole and add a Dark Chocolate Saddle Stitch Ribbon. Adhere the finished owl piece to the front of the sack with a couple foam pop dots. If you really want to make your owls look cool, add some Ranger Glossy Accents to the eyes. It will make them look like real googly eyes. Allow plenty of time for them to dry though. Package up all your goodies in a basket and you'll be all set for Halloween! I love to drop by the girls' school on Halloween day and deliver my treats. The teachers love it when they see me comin'! I always save out two treats for my mom and dad too. They get a real kick out of getting a special treat, all packaged up just for them. Poor Eric, he just gets the outside cookie crust. He feels so deprived on treat days! Well, I hope you've enjoyed my treats today! Thank you to Carmen for being my helper! Have a spooktacular day! It's SO COLD here in Kansas. Brrr, feels more like Thanksgiving weather than Halloween. I've steadily been making more Halloween cards in between my Christmas projects. Today I'm using Karen Lockhart's fun Warm Socks stamp. I love this stamp, I think I could use it for every occasion. All it takes is a little *out of the box* thinking. I stamped my image onto My Mind's Eye patterned paper and paper pieced the socks. I colored in the background image from the same stamp with an orange Copic Sketch marker outline and then glittered the inside pattern. I adhered the socks to the background image with pop dots. Here's a view of the glitterfied background. For the sentiment, I reached for my handy dandy JustRite Stamps. They're the perfect *go to* stamps if you need to really customize a sentiment. I used the Curlz Font Alphabet and my large rectangle block Harmony stamper. I used two different font size on the same rectangle block. 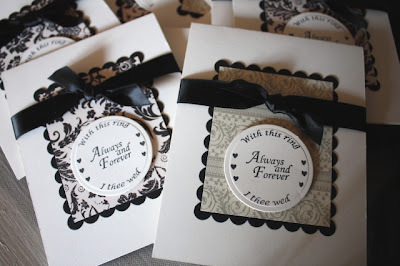 I stamped my completed sentiment into Versamark embossing ink and embossed my letters with black embossing powder. I'm loving the black embossed look for Halloween this year. I finished of a letter *i* with a burnt orange sequin sticker and added some more My Mind's Eye Halloween patterned paper and May Arts striped vintage ribbon. Who wouldn't smile when they receive this fun card? Be sure to check out the contest going on at JustRite Stampers. There's lots of goodies to be given away each day. Whew, what a fun Papertrey Release, right? There are sooooo many fun stamp sets, punches and fun new colors added to the lineup this month. I'd love to hear what your favorites were and what you ordered. If you haven't been to the Papertrey gallery yet, be sure to stop by to check out even more samples of the Design Team. 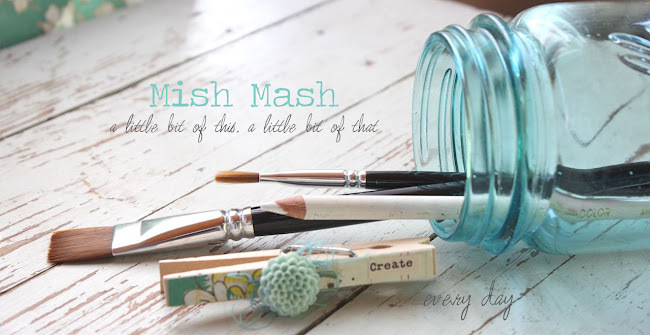 There are so many great projects, my list is a mile long of gifts I want to make. There's no need to think up something original this year for gifts, Papertrey has done the work for you! 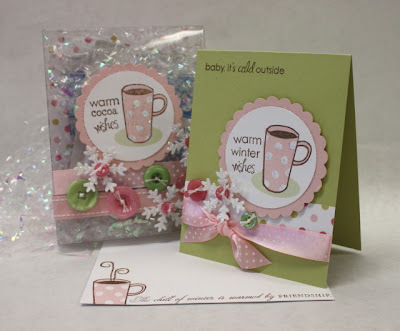 First off, my Cocoa for Two gift ensemble using the Warm Happiness stamp set. Next up, a fun frame that holds two 4" x 6" photos. I used the cute mittens from the Snowfall set on the left. I dipped the mittens in the Glue Essential pad and then dumped on Martha Stewart brown glitter. Here's a closeup of a soldered embellishment. I used the negative image of the Extra Jumbo Snowflake Punch. I inked the edges of the Kraft paper with white ink and then made a soldered sandwich. I added a button and green sequins to the outside of the glass. Tied it on with a fun PTI ribbon. Can't wait to add a photo of my family and set this on the mantle for the holidays. 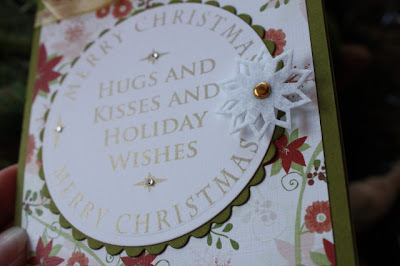 Simply and beautiful card using the Silent Night stamp set and a leftover glittered Extra Jumbo Snowflake Punch. Ohhhh, the Recipe stamp set! I'll be using this one a ton, you know how much I love the recipe cards! Here's my version of a 4" x 6" recipe card using the pre-printed recipe cards. I used some PTI holiday patterned paper and embossing on the beverage embellishments. I'll be making my mom's wonderful Hot Spiced Tea recipe and giving out a little tin with the recipe this year. Good stuff. 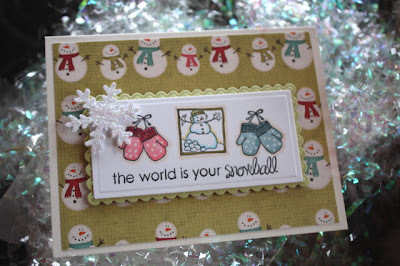 And finally, another gift ensemble using the holiday tags collection stamp set. Snowflakes are embossed and mounted on a gold Spellbinder's die. I packed up the hand scrub and lotion in a pretty frosted PTI sack along with some iridescent scrunchy filler. The card was so simple to make, I used one of the printed recipe cards! All supplies from Papertry Ink. Sooo, did you stay up til midnight???? I'm dying to know what you're going to make this year for gifts. Let me hear from you, girls!